Ma recette sans gluten et sans lait qui, je l’espère, vous fera fondre pour cette douceur. Et pourtant, rien de bien sorcier, pas de perlimpinpin, que du naturel c’est promis ! 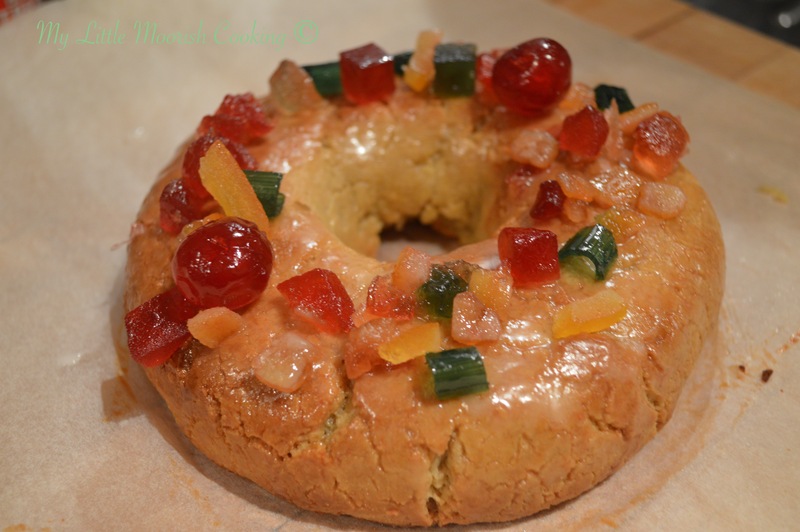 After the traditional “Galette des rois” (flaky french pastry filled with frangipane), the Couronne des rois is an epiphany speciality in the South of France. A round brioche, topped with candied or dried fruit, which is a delicious alternative at this time of year. So, here is a dairy and gluten free recipe, nothing magic, all natural and all good ! Mélanger tous les ingrédients et ajouter le lait d’amandes petit à petit afin d’obtenir une boule de pâte lisse. Façonner et laisser reposer une heure sous un torchon propre à température ambiante. À l’aide d’un pinceau, appliquer la dorure et cuire pendant 30 minutes à 180°C. Mix all the ingredients and gradually add the almond milk until you obtain a smooth ball of dough (it should not be to sticky but still be able to hold together). Make the shape of a crown and leave to rest under a clean cloth at room temperature for about an hour. With a brush, glaze the crown and cook for about 30 minutes at 180°C. Thank you for all your support Shanna, I really appreciate it! It’s so great to contribute and be part of a food blogger community… And I do think there is a big need for gluten and dairy free recipes, especially over here in Europe. I have, myself discovered all the effects of what we eat on our health and I love to think I can contribute in any way to bringing some people back in their kitchen to cook food they can appreciate and be healthy with.